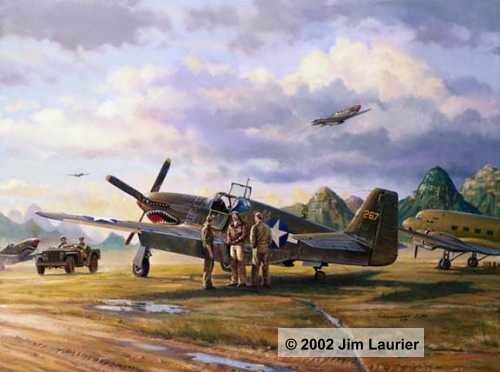 The American Volunteer Group (AVG), or "Flying Tigers" as they came to be known, flew against the Japanese before the U.S. was officially involved in WWII. After their disbandment on July 4, 1942, the pilots of the AVG would be allowed to continue flying if they joined the U.S. Army Air Forces. Some AVG pilots agreed to this and they formed the 23rd Fighter Group, the only USAAF combat group to be organized, equipped, manned and brought into operational status in an actual combat theater during the war. David Lee "Tex" Hill was one AVG ace who joined the 23rd. He is shown standing in front of his Mustang with some of his ground crew after returning from a mission as other P-51 B's and C's of the 23rd Fighter Group return to the airfield in Kweilin, China. Others drive up in a jeep to greet him and get "the scoop" on the day's action.